Chimney Noise – Squirrels, Racoons? If you are hearing sounds and noises in your chimney, and you think you have an animal in the chimney or fireplace (it’s not too hard to tell), you’re probably right! It’s probably a squirrel or a raccoon. Squirrels tend make more noise in the daytime. If a squirrel fell down your chimney, it’ll make a lot of frantic scratching noises. Above all, if you are hearing a noise right now, call us immediately, so we can come check it out for you. DO NOT START A FIRE! If you have squirrels in the chimney – you’d have to open the damper to let the smoke out, and they will enter the fireplace instead of climbing out. Even if they don’t get into the your house or fireplace, you will cook animals alive and get a horrendous odor that will last a long time. Not fun! Squirrels live in chimneys as well as attics. Your chimney is just like a big, hollow tree to some animals. Squirrels are great climbers, and they need a safe, dry place in which to live… so if your chimney doesn’t have a chimney cap, get ready for some visitors! Female squirrels instinctively seek out high areas in which to create a nest. Because squirrels are so common in urban areas, they often climb on houses and other buildings looking for a good place to set up a nest. If they see an open chimney, that’s a great place to pick. 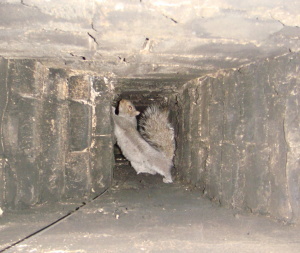 They can easily climb down the flue, and they usually set up a nest and have a litter of baby squirrels at the bottom. Not really the kind of thing you want happening in your chimney, right?! So, if you have squirrels in the chimney there are several things you can do. Odor deterrents such as predator urine might work, because it’s a very concentrated area, as opposed to a large and well-ventilated chimney. The best is to set a special chimney trap at the top of the flu, which catches the squirrel as it exits. If there’s babies inside, they can then be safely removed by hand. You can also set a ground trap at the base of the chimney and do the same thing, though the capture rate may not be 100%, like with the chimney trap. You can scare the mama squirrel out and remove the young, then use the young as live bait. Many professional wildlife removal experts have special squirrel in chimney removal systems if odor deterrents don’t work. Just remember to get the babies as well as the mother! 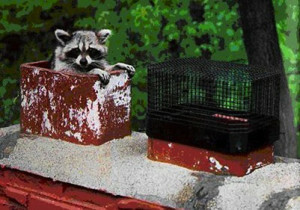 Once all the squirrels are out, install a sturdy steel chimney cap to prevent this from happening again. Oh, and if you don’t have a cap right now, make sure the fireplace damper is closed, or else critters may wind up inside your home and not just the chimney.